With the inclusion of modern equipment and sophisticated machines, we are engaged in offering a qualitative range of SS Regulators for Chemical Industry. The offered range is using advanced machinery. Being a quality-oriented organization, we assure our clients that this range is absolutely defect free and the best in quality. Apart from this, offered products are available at market leading price. 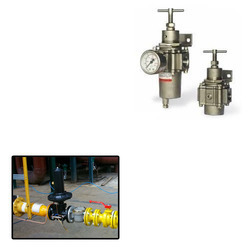 Looking for SS Regulators for Chemical Industry ?